From the A40 in Crickhowell take the turning to Llanbedr either by the fire station when approaching from the East or via Llanbedr Road if approaching from the West. From the fire station, as you leave the town turn left up Great Oak Rd towards ‘Grwynefechan 4’, after 1.5 miles continue past the right hand turn to Llanbedr with a sign ‘Llanbedr ½’ for a further 0.3 miles and Ty Mawr farm is on the right and the entrance to Porth Y Pia is the next entrance on the Left. The route from Llanbedr Road joins the Great Oak Road as you leave the town. Pilots are instructed to avoid parking in the small layby and in any of the gateways near the entrance to Perth Y Pia. Space on the roadside is limited and will cause issues with other local road users. The Club has therefore agreed a parking arrangement with the Jones family at Ty Mawr farm who own the Porth Y Pia bunkhouse. There are 3 locations available to leave a car. You are allowed to drive up to the bunkhouse and if it is mid week or obvious that the bunkhouse is not rented out during weekend, you are able to park at the bunkhouse. Alternatively, drop your flying equipment off at the bunkhouse and drive back down the track and park in the bottom field just inside the gate. The third option and quickest is to park in the campsite field just past the farm buildings on the right, kindly do not block the entrance to the campsite. Pilots are asked to pay £2.00 per car, please take this to the farm house before parking and if nobody is home then leave the money inside the porch. An alternative to parking at Ty Mawr is to park in Crickhowell either in a pay and display or on the side of the road and then use one of the footpaths up to take off or car share to Ty Mawr Farm. Click Here to book a day pass. Access to take-off is via the footpath starting at the gate to Porth Y Pia. There are many footpaths up the hill, but this is the recommended one for both take-offs. From the road take-off A is about 2km and take-off B a further 1.5km. All top landings are relatively easy with a gentle slope to hill edge. Any paragliders slope landing need to be aware of the uneven ground and isolated rocks hidden within the bracken and grass. If slope landing do so within the hill enclosure as no permission has been granted within the enclosed fields below take-off. From take-off A, use the bottom landing field C. This is a meadow used as a public amenity area. This landing area has a couple of trees and rubbish bins within the meadow. In stronger valley winds from the West the trees to along the Western side can create rotor and therefore in this instance aim to land within the Eastern side of the meadow. The site is best suited for use as a XC site on light wind days. The gentle slope on take-off away from the top of the mountain does however permit an easy take-off in moderate winds. 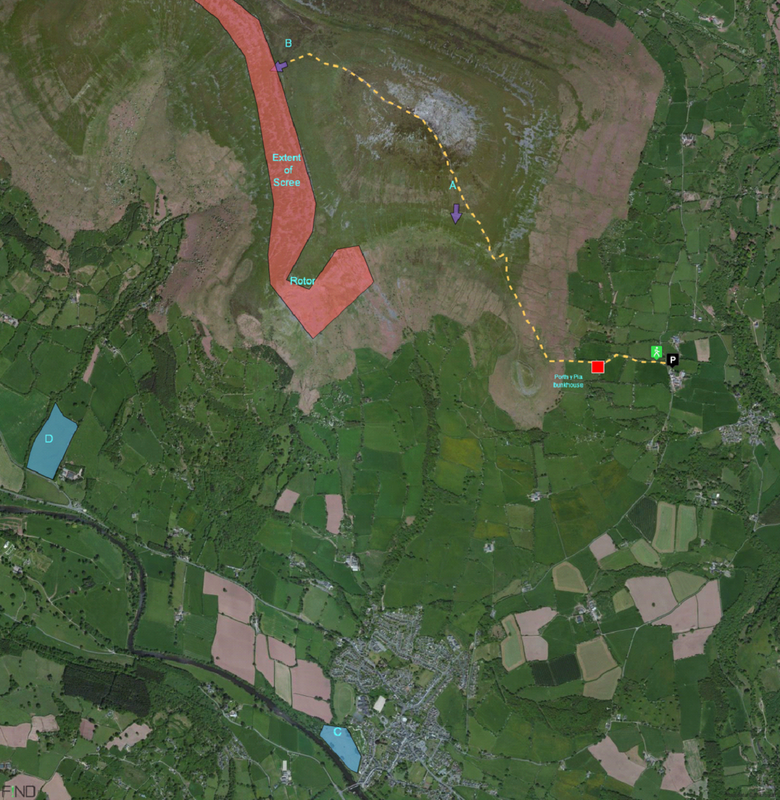 Thermals will move up the mountain from the take-off before releasing from the peak. Both landing fields can be reached on a glide from the take-off height, but pilots need to ensure they make the decision to leave the hill with sufficient height. The main hazards of the site are the large rocks on the slopes below take-off. Some of these are clear as areas of scree but many are hidden with the bracken, this hazard is particularly relevant to the SW take-off and extreme care is required if attempting to slope land. The cliffs on the southerly spur (The Darren) between the two take-offs will produce some rotor in stronger winds. SEW Members Only Site. You must have in date membership subscription to SEWHGPGC and be BHPA pilot rated. SEW helmet sticker to be stuck on your helmet at all times. PG – Eddie Colfox flew 111.7 km on his Ozone Rush 4 on 09 April 2015.